At the Marine Dealer Conference and Exhibition (MDCE) this year in Orlando I had the pleasure of meeting Lisa Herndon. She was talking to a lot of dealers and attendees at the show about the US Power Squadrons latest project – the Virtual Trainer. It’s the result of a grant, the first of its kind and a really neat way to practice/learn how to drive a recreational power boat. The Virtual Trainer has 9 exercises, is multi-lingual (Spanish and French). You’ll be departing the dock on a 20′ Boston Whaler with a real mercury marine throttle. There are posed exercises to be used with an instructor to help with rules of the road, docking exercises, mooring, navigational, plus more. Robin, thank you so much for posting and sharing this important information on the new Boating Skills Virtual Trainer! This is a great overview to see if this trainer might be right for someone wanting to hone their boating skills before getting behind the helm. Lisa, I’m glad I got the opportunity to try the Virtual Trainer out. 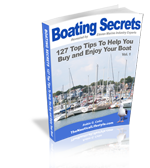 I think it will help a lot, especially for new power boaters and the “older” sail boaters who are looking at changing over to a power boat.